Our latest breakthrough in product development is represented here by this unpainted prototype called Slicer which is now undergoing the most rigorous field testing imaginable; my son is using it. Based on what we've seen so far, it is going to raise the bar for all future vertical woodworking bandsaws in terms of versatility and vibration-free quality. Slicer will fill the gap between lumber mills and vertical woodworking resaws. 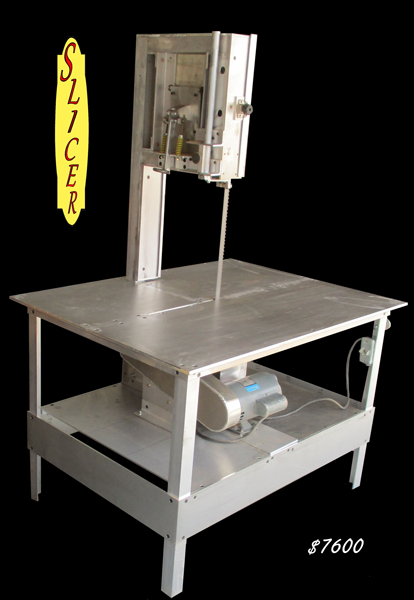 Slicer comes equipped with a beefed-up version of the Frictionless Tension and Tracking System. It stands a total of 6' tall with a table height of 32". The guides are a beefed up version of the same guides we always use. blade widths from 1/4" to 1"
Blades are changed by removing a quarter-panel of the tabletop. The blade guide extension post is 16" long. Slicer weighs about 180 lbs. 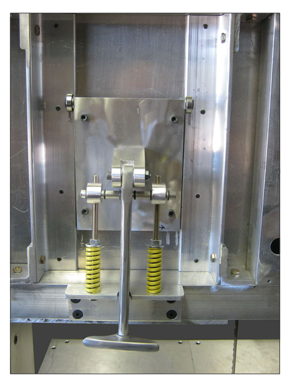 and it will come with an optional rail and sled feed system custom sized for your application.